build Redruth and other viaducts. My attention first drawn to this branch by a clip from the West Briton Newspaper dated 24th February 1972- it mentioned the discovery of the branch by the well known local historian. Mr Michael Tangye M.B.E. Length - Just under half a mile. Gradient - From the main line junction to the quarry is approx 2060 feet, the difference in height between the main line and quarry is about 88 feet. Therefore the ruling gradient is of the order of 1 in 24. However the gradient from the main line to its turning point onto the flanks of the Carn must have been steeper with the gradient easing off across the flanks. Gauge - The main line from which this branch stemmed was originally constructed to standard gauge. This was converted to mixed gauge w.e.f. November 1866 and finally reverted to standard gauge w.e.f. 20th May 1892. It is not known whether this short branch was broad or standard gauge but probably the latter. Purpose - The line was used for only a short period in order to carry stone used in the construction of Redruth and other viaducts West Cornwall. The source of the above drawing is not known***, it came to my hands many years ago. The top drawing covers a distance of about one and a half miles along the current main line west of Redruth. Milepost 312 is just to the west of the old Carn Brea station site and milepost 310 3/4 is on the west end of Barncoose embankment. With reference to the larger scale map of the junction with the main line itself it can be seen that at the time the main line was single. A siding and head shunt of a total length of 420 feet was provided as were signals, both home and distant in both directions. A signalbox or cabin is illustrated. What appears to be a roadway as in fact a leat which carried water from up in Redruth Coombe to mine works out near South Crofty. Although the main line is shown as crossing the leat by means of a bridge in fact as the line was already in a cutting at this point the leat passed from a high level at one side of the cutting to a high level on the far side of the cutting by means of a large pipe under the track. Quite how the Quarry branch crossed the leat is not known, probably by means of a simple wooden structure. *** Mr. R.A. Cooke, (Tony) , has very kindly drawn my attention to an error in the paragraph below the map copied above. 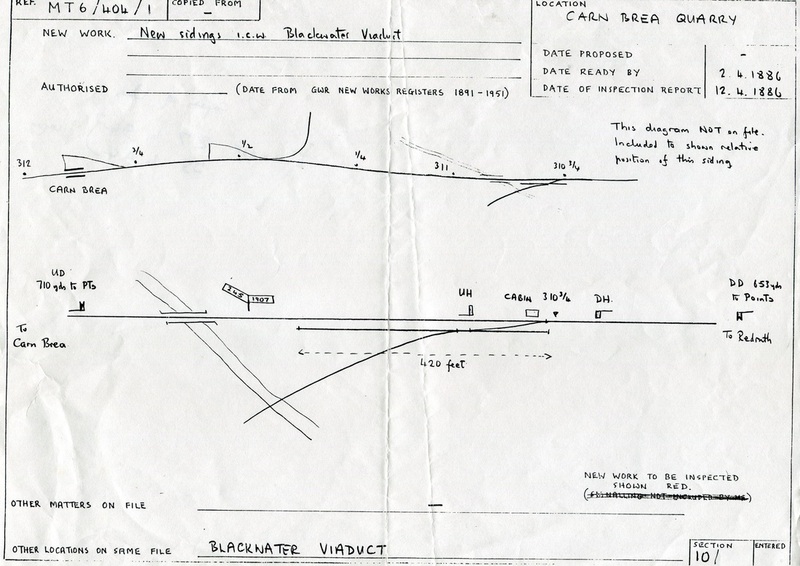 So far as the Carn Brea Quarry branch is concerned the drawing that is reproduced with “source unknown” is in fact a photocopy of my own file note. The information came from a file at Kew, in the National Archives, and ref. MT6/404/1 refers to the papers on the Board of Trade Inspection of the new work. The GWR advised them on 2.4.1886 that it was ready for inspection and the 12.4.1886 date is that of their Inspection Report. The G.W.R. Engineering Committee had reported on 26.11.1885 that “In connection with reconstruction of Blackwater, Chacewater and Penwithers Viaducts, that for the convenience of Mr. Gabbutt, the contractor, it had been arranged to put in at his expense, sidings at Carn Brea and between Blackwater and Chacewater Viaducts”, so the statement, at the top of the page, that the line operated from 1884 cannot therefore be correct. N.B. The date previously given as 1884 has now been corrected, we are most grateful to Tony for this additional information and for his time and trouble both in research and in contacting us. ﻿The route of the branch. No maps as such exist of this short lived line, it was between issue of the OS maps, a rough description of the route is perhaps best given using as reference a Google Earth Aerial View. Select Google Earth and search for 'Redruth', the area of interest is firstly Barncoose. The quarry is located due west of the legend 'Carn Brea Village' on the aerial view. The quarry is on the east face of the prominent Carn Brea Hill. Zoom in until you just get the main line and the quarry within your screen. The leat ran just to the east of the farmhouse now in the centre of your view and can be seen as a wide hedge heading roughly northwest towards the main line. Where the course of the leat meets the main line the line is already in a cutting, the leat passed under the main line by means of an inverted syphon. The siding and head shunt shown on the above plan were roughly on the current down main line alignment, the main line at that time being single track between Redruth Junction and Portreath Junction, this was doubled with effect from 8th March 1894. 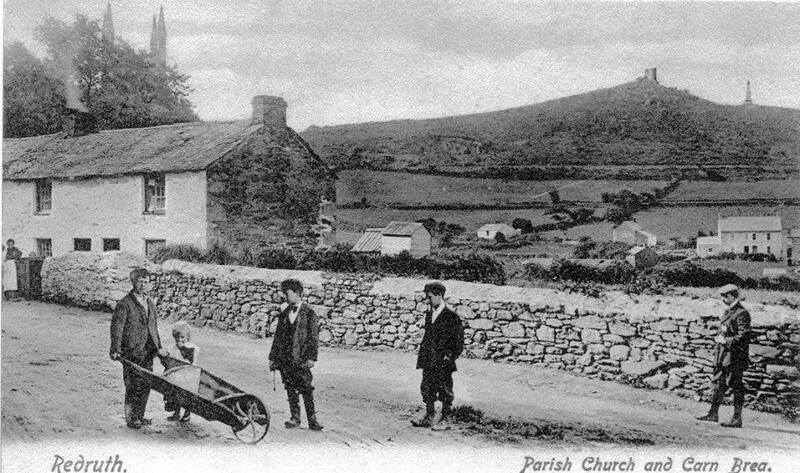 An old post card of the Carn. In this one can clearly see, to the left of St Uny Chuch tower, and the quarry. Also a mysterious trail of smoke or steam. The course of the railway can also be seen. 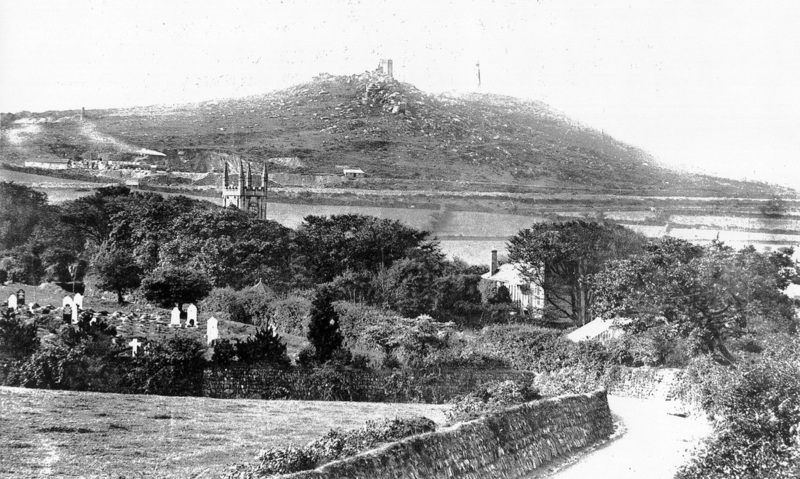 The roadway in this view is Church Lane - this ran from the centre of Redruth to the Church. It was down this lane that William Murdoch first tried out his model low pressure steam engine. This was, in 1784, the first ever mobile steam vehicle. The vicar of St Uny, seeing this 'thing' approaching down the lane past the graveyard thought it was 'something from the devil' and rapidly retreated into the rectory grounds through a small gateway visible to this day. The rectory being the large house visible in the middle of this picture. Just above the chimney stack of the rectory a hedgerow can be seen, this is the course of the leat which later passed under both the Quarry branch and the main line. Zooming in closer to the postcard above one can certainly see some trucks standing on the railway to the left of the quarry. Whether the steam is emitted from a locomotive from some workings in the quarry it is not possible to say. A distant view of the quarry from a postcard - part of the Alan Harris Collection. Note the 'Cornish Wheelbarrow'. The original timber viaduct dates from the opening of the West Cornwall Railway which extended to Hayle Railway to Penzance in the west and to Truro in the east. This was opened on the 25th August 1852. Its replacement by the present magnificent structure dates from 13th March 1887 when half of of the replacement viaduct came into use and final completion was by August 1888. Although the some of the stone must have come from Carn Brea Quarry over the branch line. The late Mr. C.R. Clinker suggested that maybe the coping stones came from Princetow. The dates for the branch suggest that only the second half of the viaduct used stone from the Carn Brea Quarry. It has also been suggested that stone from the quarry on Carn Brea was also used in the construction of viaducts in West Cornwall. ﻿Dates of West Cornwall viaduct reconstruction Redruth completed in 1888. Penponds completed in 1886, Guildford completed in 1886. Angarrack replacement was also in progress during this period.